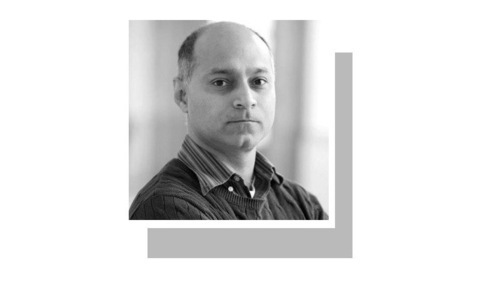 IF the take-off of a new political government is any indication of the long haul, the Pakistan Tehreek-i-Insaf’s (PTI) measured start in its first two weeks in office almost borders on indecision. This is particularly true in the economic field, although the government completed the process of forming the governments at the centre and in the provinces within a reasonable period. A couple of meetings of the federal cabinet have rolled out almost half a dozen task forces to delve into repercussions of issues ahead as a first little step instead of taking an upfront decision to fix them. These committees would look into reforms in key areas such as austerity, restructuring of the government, civil service reforms, corruption and the creation of a new province. What will the government do while it waits for the reports of the task forces? Seek sectoral and ministerial briefings? Perhaps that is why Imran Khan had to finally request impatient critics to examine his performance after three months or his first 100 days in office. This request came as he took the heat over certain unsavoury actions by some public office holders under his leadership. 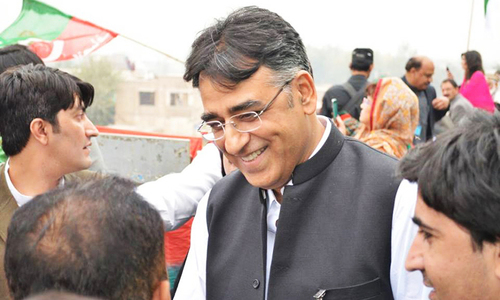 He was quick to decline a request from the cabinet division to personally head the economic coordination committee (ECC) of the cabinet, but did not decide whether or not to lead the three other committees of the cabinet on restructuring, privatisation, energy and the China-Pakistan Economic Corridor. Instead, he appointed his Finance Minister Asad Umar as chairman of the ECC, which has 12 other members — six of whom are yet to be appointed. This has some of the few experienced technocrats of General Pervez Musharraf’s government such as Razzak Dawood, Dr Ishrat Husain and Sheikh Rasheed Ahmed. Other members of the ECC would include minister for law and justice Farogh Naseem, petroleum minister Ghulam Sarwar and planning and development minister Khusro Bakhtiar. The decisions of the finance minister-led ECC would, therefore, always need be endorsed by the federal cabinet for legal cover. In addition, six more ministers — communications, national food security, power, privatisation, statistics and water resources — will also become members of the ECC whenever they are appointed. But the outcome of the first meeting of the ECC of the Cabinet was not promising. It deferred a decision on the most difficult political item on the agenda: whether or not to increase the natural gas tariff after almost five years. It formed two committees on three power sector-related matters and took no formal decision. The new government has to get over this hesitance. The markets are waiting and watching. The government has to create its own image by taking actions before its goodwill and political capital starts fading. Prime Minister Imran Khan has so far avoided the most crucial decision the country’s economic situation requires at the earliest — engaging with the International Monetary Fund (IMF). An early engagement is a sign of shared understanding of the challenges and inclusive decision making. A bit of a comparison with the predecessors may be of some help. The 2013 general elections were held on May 11 and the prime minister was sworn in on June 4, as per the Constitution’s requirements; followed by the federal cabinet being sworn in on June 7. Within the next week, the former government announced the federal budget on June 12. It was able to conclude an IMF bailout programme over the following 10 weeks. In contrast, this time the prime minister took the oath of office on Aug 18 after the elections on July 25, and formed the cabinet within two days. There are no signs yet of where the cabinet is headed as it completes its second week. That practically means that the state remains in a cycle of uncertainty for almost the fifth month running. The first decision of public importance so far has been the full implementation of the recommendations of the Oil and Gas Regulatory Authority for reduction in the prices of major petroleum products. 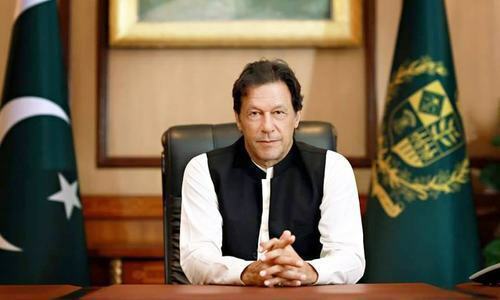 On the other hand, Prime Minister Imran Khan maintained the tradition of former prime minister Nawaz Sharif by appointing a grade-21 officer as his principal secretary, to whom more than five dozen grade-22 officers of the federal and provincial governments would have to report. This style of seniors compelled to work under a junior officer sets an unsuitable precedent for meritocracy to take roots. On top of that, Prime Minister Khan also followed the footsteps of the PPP and the PML-N by appointing an officer of the District Management Group (DMG) as head of such a specialised agency as the Federal Board of Revenue (FBR). Despite being good officers like the new incumbent, the service delivery and performance of all DMGs as heads of the FBR has always been found wanting. The government also did not stick to its commitment of separating the roles of revenue policy and administration and assigned both functions to the FBR chairman. He was greeted on arrival by a display of black-strips by officers of income tax and welcomed by customs’ officers. The exchange that followed showed that the FBR may again see an environment of stiff confrontation and tension in the days ahead. The new chairman of the FBR has demanded two critical presentations over the next few days: how to replace the existing system of annual confidential reports based on likes and dislikes with an objective evaluation system for promotions, and how to ensure merit-based posting. Lets first audit NS 5 years what we gain and lost? So far PTI government has not been able to make the big bold decisions. The ongoing tweaking and adjustments are mostly done for getting media attention. Let us wait for at least three months as the Prime Minister has indicated. Big talking and zero delivery. Juts like President Musharraf, the first few years will take work hardest ground work to fix the economy, health and education, benefits will begin come after 3 years! Fixing ugly mess takes not takes weeks but years! @Aamir Seems you are from Maryam's team. Dont copy paste your comments on articles. 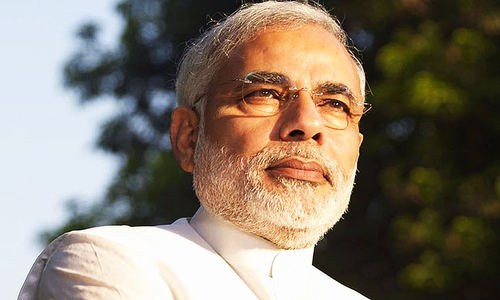 @Aravind Take care of Modi jiiii......we will take care of IK. so far they have been trying to tell the plunders of previous govt. they didnt share any plan of their own... how will they move forward, how would they stop corruption from now on.... just a replication of previous govts. and as far as auction of vehicles is concerned ,,, IK wants to sell assets of govt to his friends and then he would hire these vehicles to establish their rent a car business... The vehicles to be auctioned range from 1996 to 2016.. .the written down value would be "zero" and they will sell these cars on throw away prices. How ironic...everyone was quick to pounce on Nawaz when he went straight to the IMF in 2013, and now IK is trying to avoid that route at all costs, the same people are pouncing on him. The beauty of unaccountable media. 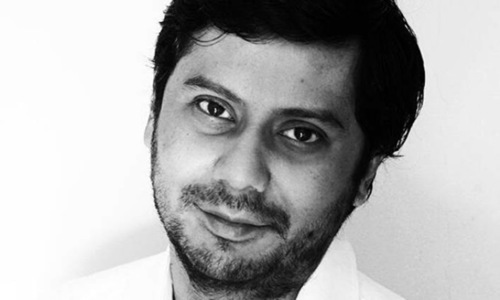 @Jalaluddin S. Hussain Correct, in fact give him at least a year. What about the promised army reforms? Also it needs to be reined in to serve PM IK as the ultimate decision maker. PTI needs to bring in a real and fair income tax policy and broaden the direct tax level and then decrease the indirect taxes on consumables like wheat, milk, ghee, and all other such items. Two weeks analysis is unjustified. They should be given atleast 100 days to settle down. And after an year, their efficiency levels should be marked. This is going as predicted. A. Achievement Number 1- Appointment of absconding Commando as Law Minister. Now "Treason" is no longer an offence. B. Achievement Number 2- Replacement of Cars with Helicopters. Why drive when you can fly. Roads no longer required. Are you serious? For a serious business of taking over Government of world’s 5th largest country, by a novice team that’s already been burdened with colossal challenges that may need 10 paragraphs to write about? And you expect them to turn everything green in a fortnight? That’s really unfortunate and grosssly mistaken. Media should be patience Imran Khan was just elected 15 days ago. What can you except in 15 days? 30 Plus years of mafia of Nawaz and Zardari and here we are judging Imran Khan in few months at least give him half the time as what we gave to looters and plunders of Pakistan. Going to IMF is not a IK decision it would be a parliament decision. Also, he has already started on most of his promises. The task forces, startup of his tree planting, not living in PM house like a king with all the servants, auctioning of cars, reaching out military head and nab chairman, meeting with delagtes from turkey, iran, china, afghanistan and even japan. 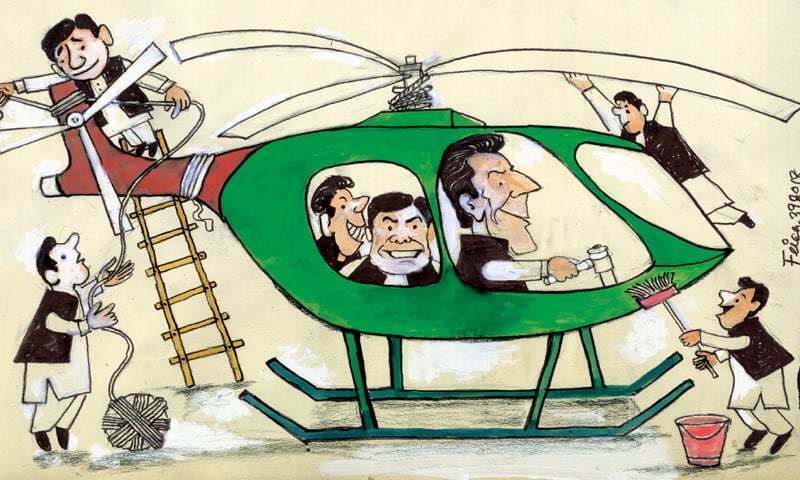 Just because media is focused on helicopter bills and choice of cabinet doesnt mean IK has had a rough start.. he has probably accomplished more in these 2 weeks than what previous govts couldnt do in 2 yrs. As of now the PTI led federal government in is "would be", "going to do" mode. Nothing concrete yet, other than tree planting. Media refrained auditing nawaz Shareefs govt even after Panama gate, rising debts and growing corruption but is already doing audits of a 3 week govt?? The amount of bad done to country by ppp and PML N it will take time!!! Give them 5 years. 70 years of mess clearing takes at least 5 years to clear if you want it evolution way. If you want it revolution way like Iran, one week is enough. He is just in the office. It would take some time. And also they are very first time forming the government. There may be some delay or mistakes at initial. But they are all learning curve. Give him 3 months time as he mentioned before judging.